Day 2 starts off with an interactive tasting demo intended to pick apart the different aspects of how we experience food. By considering the different biological/neural pathways by which our brain gets information, interprets it, and puts together the inputs to draw meaning/understanding of what we are eating, you will have the opportunity to very much tease your brain. 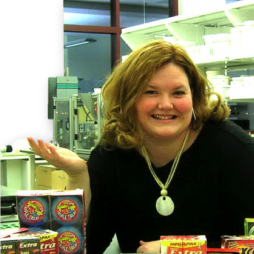 Gwendolyn has worked for the Wrigley Company for 18 years; her first 5 years were spent at a subsidiary – where she primarily worked on R&D for kids’ bubblegum. Although always product focused, she has spent a great deal of time in the early development process – ethnography, ideation, focus groups, prototyping, and concept work – using consumer insights to help form new product ideas/concepts into commercial products. She has bachelor degrees in Chemistry and Biology from North Central College in Naperville, IL.